Lyle Lieder's first visit to Mayowood was in the 1940s, as a guest of Dr. Charlie's grandsons. His love of cars brought him back to the historic home earlier this year. The story begins, like so many stories from Lyle Lieder, with a car. It was 1943 and Lyle, then a senior at St. Olaf College in Northfield, Minnesota, was standing on the side of the road, thumbing a ride to see his fiancée, Betty, in nearby Waseca. He visited her each Wednesday, and "hitchhiked every other week to save money," he tells us. On that day, a brand new black Ford pulled over, and Lyle slid in. On the drive, Lyle talked about his plans: to finish college, marry Betty and attend Boston University School of Theology. "Have you ever thought about teaching?" the driver asked him. "We need teachers over at Shattuck." That's Shattuck St. Mary's, a private boarding school just down the road in Faribault, Minnesota. And though he hadn't considered teaching, Lyle decided to visit the campus to learn more. When he left, Lyle had an offer to teach for a year. It would mean rearranging his class schedule at St. Olaf and require him to take summer classes to graduate. It would also mean adding more to a schedule that already included pastoring two small churches. But in exchange, Lyle would receive room, board and a $1,500 salary. He and Betty talked it over and decided it was an opportunity worth taking. After Lyle finished his teaching contract at Shattuck, he and Betty married and moved to Boston as planned. They'd eventually make it back to the Midwest, where he ministered to United Methodist Church congregations throughout northwest Iowa for 41 years. Along the way, he's also ministered to cars, buying, fixing up and selling close to 200 antique vehicles, a hobby he writes about in his book, My Life Behind the Wheel. 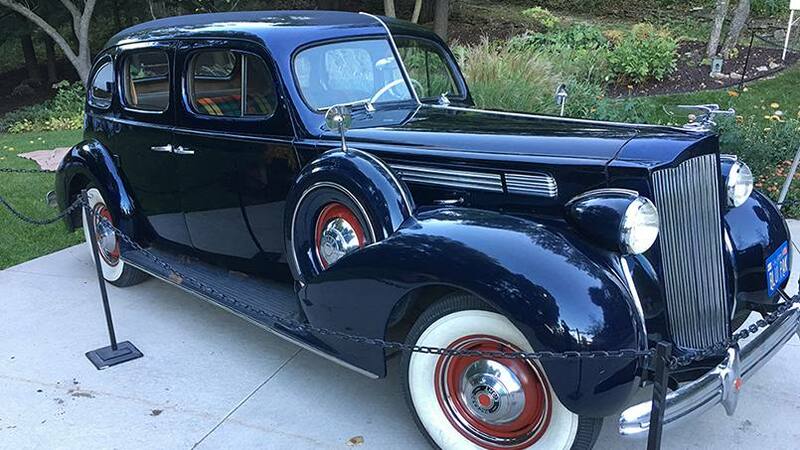 Recently, one of those vehicles — a 1938 Packard Eight Sedan — brought Lyle back to Mayowood, where he also met up with another old friend. The car was featured in a Heritage Days event that drew more than 2,000 Mayo staff, family members and guests to Mayowood, including one of Lyle's former students. "Charlie is 87 now, but he still introduced me as his 8th grade teacher," Lyle says with a laugh. He tells us Mayowood, and his former student, remain "exactly the way I remember." If you'd like your own glimpse into Mayo history, consider touring Mayowood for yourself. Special Christmas tours run through Dec. 17. Then remember to leave a comment below before using the social media tools atop this page to share this story with others. Read more about Mayo Clinic's Heritage Days.